Minion outfits for kids – What are the two cutest things on earth? For me the answer would undoubtedly be minions and babies, combine the two and you definitely get an overdose of cuteness.If you are looking for ideas how to dress your baby in minion dress?latest minion outfits for kids then this post is for you. In this post we’ll be sharing some interesting ideas, tips and suggestions to help you dress up your little angel like a minion.These are the dress that you kid will love surely.And you can dress them in on your kids birthday party. 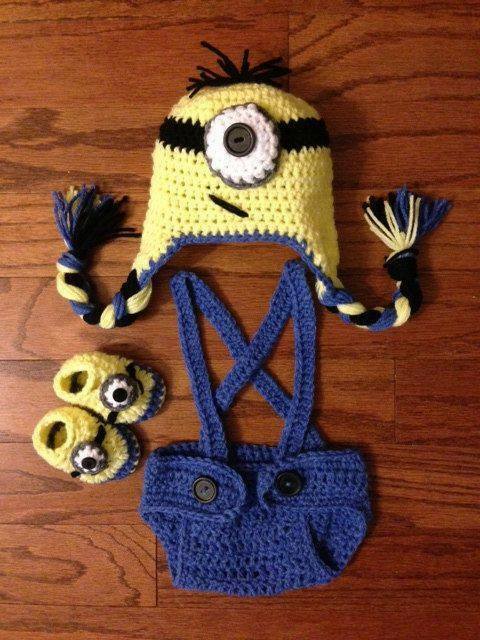 If you are into knitting, then you can surely knit the most adorable minion outfit for your child. They can even be used as gifts which will be loved because who doesn’t love minions? You can find a number of knitting patterns on-line, which require only two or three colours of wool and are actually pretty easy to get a hang of. If you are a beginner, I would suggest that you start with the minion hat and then move on to the shoes and finally the main outfit. Once you learn the basics, there is so much more you can come up with, like cute little minion mittens, goggles, hats, scarves or a purse or may be even an adorable minion toy. Such hand knitted outfits would be the perfect ones to dress up your baby in the winters. Here are a few ideas to help you brainstorm. 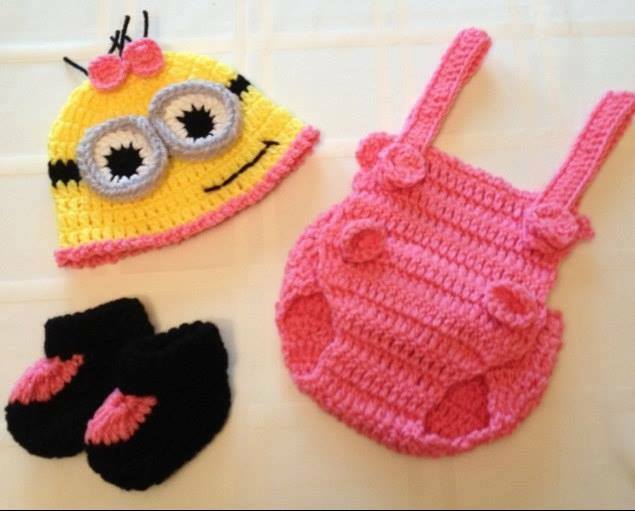 Crochet Pattern Minion beanie Hat with Dress : Must see our collection of cute crochet pattern beanie hats for babies. Cute Kid in Minion Dress. Another innovative idea is to knit a minion hat and a cocoon. For a change, you can even make a hooded cocoon. Again these cocoons are the easiest to knit up and will keep your little one all warm and cozy in the winters. Now that we are done discussing the winter look, lets talk about some summer outfits. The yellow, blue and pink colours would make perfect outfits for the summers. Just imagine your baby in this cute yellow oneside, which can be used for both girls as well as boys. If you like onesies but don’t want the full minion look, you can always try something different. How about some minion phrase on a onesie or shirt, like “one in a minion” or “mommy’s little minion”. If you want you can always make these yourself by painting on one of the baby’s onesie using fabric paints. Here is another do it your self minion costume, made by using foam. They are easy to make and are ideal for Halloween costumes or themed parties. When it comes to girls, I always find tutu’s to be the best party outfits. A yellow and blue tutu like the one shown here is not just cute but also creates the perfect summer look. Of course you can always add your own touch to the outfits and final look by designing new minion themed hair accessories or jewellery for your baby girl. If you like hoodies then you can easily find minion hoodies in any good store or you can always order one online. They can be used for both babies and toddlers in summers as well as winters. Once again, if you want you can follow the simple online tutorials to knit your baby a hoodie by your self. If you are buying one, make sure that its comfortable for the baby so its worth your money. DIY Minion Dress :Here is another idea how to make minion dress easily at home yourself. For 1 year Old – There are not many outfits which look cute on bald babies but minion outfits are surely ones which do. Check out the simple goggles this cute little munchkin is wearing. The purple minions may be evil but are still cute aren’t they? Plus they help create an entirely new and different look. This is very fascinating, You’rea very professional blogger. I’ve joined your rss feed aand sit up for looking for extra of your grerat post.